I really have been reading. Promise. Snippets here and there. But during November and December, any writing (besides the occasional blog) was seriously held up by holiday hooplah (and yes – the general status of disarray around these parts). An almost blank word doc sat on my desktop for seven weeks. Seven weeks I tell you! The title in bold. The next line in italics. “Reviewed by…” (yours truly busy). And one subheading. Just a handful of letters sitting there. Watching me race by with diapers in hand, dump baskets of clean laundry on top of each other (to fold later), and “hunch-back” over spilled toys, wishing I was in bed. 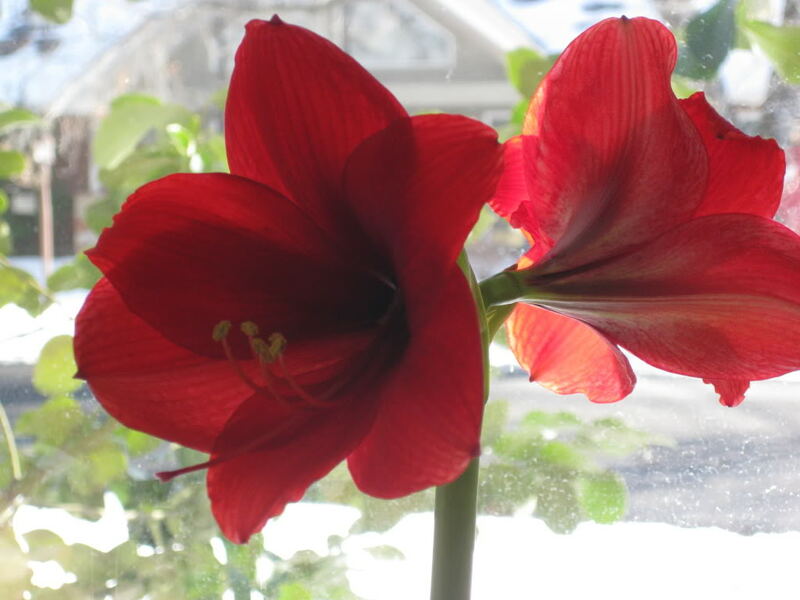 49 days later (give or take a few), with the Christmas tree at the curb and my last amaryllis in bloom, I finally finished that review. And here it is, it you’d like to read it in full. Mormon Women affected me deeply. In 1996 Kent Miles and Jim Kimball began a unique project: Tell the story of Mormon women. I’m talking about members of The Church of Jesus Christ of Latter-day Saints. Not polygamists or Warren Jeffs worshipers. REAL Mormon women. They wanted to find women who were doing their best to live as true Christians amid the deep waters of modern-day life. Women who didn’t conform to external expectations. Women notable for their own accomplishments (not their husbands). Women who gracefully rose above challenges, exemplifying courage, valor, and compassion. There was no shortage. They worked off referrals and ending up traveling the globe. But there was one problem. They were two Mormon men. And who needed more men talking on behalf of women? Miles and Kimball knew this was a tough hurdle so they decided their role would be as documentarians. They would get women talking about themselves and they would listen. The result was this book. Fourteen women interviewed, telling their life stories in their own voices. Their histories are astonishing, inspiring. Each breaks down norms and dispels stereotypes perpetuated by popular media. These women will amaze you with what they have accomplished and contributed to the world and their families. They are from every corner of the earth. Some single. Some married. Each sustained by an unshakable faith in God. A reformed communist guerilla. A mother (and later well-known humanitarian) who personally drove over 20 convoys of emergency aid into a crisis area in Bosnia. A best-selling mystery writer. A survivor of Stalin’s gulag prison system. A Utah Supreme Court justice. A Harvard professor. An award-winning poet. A Paris fashion designer. A sought-after Tiffany’s jeweler. These are some of the women interviewed. Link to Meridian to read excerpts from their interviews. Powerful. Mormon Women was my favorite read for 2009. Really. I recommend it for EVERY Mormon woman, for anyone who expresses concern about the status of women within the LDS Church. No matter who you are, these stories will move you. They are rich with ideas and words you will want to return to. A second volume is forthcoming. Surely there are more stories to tell. Alright I can say a little bit more, but this is one you just have to read. It’s the story of a woman who survived the Rwandan Holocaust – a story of faith that can move mountains. Ilibagiza tells her story of growing up in a peaceful Rwanda, but suddenly with prodding from extremist government leaders, the country erupted into a bloody genocide. Tutsis and Hutus (the two dominant tribes) were suddenly at odds. The Tutsis, who were considered inferior and sub-human by Hutus, were almost completely ahnilated. Ironically, the killers were neighbors, friends, school mates, and co-workers. It was madness. And Imaculee lived through it. She hid with seven other women in a tiny bathroom for nearly three months (!) while Hutus from her community stalked the streets wielding machetes and calling her name. The rest of her family was slaughtered, except for one brother who was studying out of the country. Remarkable truths rise from her story of ashes. Like how her relationship with God gave her serenity in the midst of horror. How her faith became so strong she literally made herself invisible to the hunters. How God taught her to forgive even the most detestable acts. The year was 1994 when the atrocities began. How did I start college without having a clue what was going on? It took months for the UN or any other government to get involved. All the while I was toodling around a university campus, laughing with friends, worrying about what to wear, while a woman my age was desperately trying to stay alive. Left to Tell is a humbling read. Ilibagiza later emigrated to the states and began working for the UN in New York City. In 2007 she established a charitable fund, which helps support Rwandan orphans. So – what’s on the bookshelf now? Here’s my reading queue. Always growing. Rarely shrinking. Anything you recognize? I’d love to know if some of these are on your shelf too. I’m only a few chapters into most of these. And the parenting book I have yet to crack. So I’ll post my take on these reads next month. Feel free to chime in with your own book reviews. Back to books. A small thing, but one that makes this Mamma happy. I believe you just type in your info in on the right and it'll create the code and then paste the html code into your site (I think it says you can put it anywhere in your blog and it'll read your info). If you have more questions let me know and I can for sure break it down more! By the way, if I remember correctly I think it took a while for it to load up my pages. Also the longer I have it the better it relates the posts to one another. Catherine, you are AMAZING! I'm continually impressed by how you are not only able to successfully raise a family, but can find time to read incredible books and share your opinions of them with us. Thanks for being an inspiration! I read John Adams a couple of years ago. I started off thinking that I probably wouldn't finished it, but then absolutely was hooked. I mean, it was fascinating. It affected me so much, that right now I am reading a biography of George Washington, and I have also read 1776. The times of John Adams were so pivotal in our nation's history and the individuals were all so much more complex and interesting than I thought from my high school US history days. I loved it. Mary – I guess we find time for what we love, right? Even if only in snatches. Michelle – Glad to know you loved McCullough's Adams. It was Doug's favorite read last year. A friend of mine also lent me Irving Stone's Those Who Love – about Abigail and John. Have you read that one? I appreciate your opinions Michelle. Thanks for chiming in! And Debbie – bless you for getting back to me so fast! I'll give it a go and let you know how it pans out. Thanks a ton! will pick up Mormon Women at your recommendation. Cristie – So glad to hear you loved Crossing to Safety. I'll move it closer to the top of my list! Thank you for your reviews. I'm planning to add these to my lists. I was heading out to my mission just weeks after the genocide started and I didn't even have a clue. The movie "Hotel Rwanda" is a must-see. I had to avert my eyes during parts of it. Erin – thanks for the reminder. I forgot about that movie – Hotel Rwanda. I never saw it. But you're right – sounds like I need to now! Hey it looks like it's working well! To be honest I have no idea if it reads the tags or the titles. I'll check into it though and let ya know. Loved your reviews. I used several quotes from Left To Tell in my sacrament talk a few months ago- that's how much I loved her courage and her faith. As for your stack, I loved The Way He Lived and Everything is Fine, but I also love the women who wrote those! Brod! Do you also know Ann Dee Ellis? I'm part way through that one. Fascinating how she structured the book. Finished Hunger Games. Phew – Intense. Like a scary movie I couldn't turn off. I'll review that one in a later post. And looking forward to reading Emily's book. hello cath! i was so moved by "left to tell" and i am glad you too enjoyed it. what an amazing triumph and what inspiring faith. along the lines of "man's search for meaning" by victor frankl. absolute must-reads, in my book. I loved both the hunger games books (hungry for the next one too!) and i am currently reading 2 love & logic books. angle of repose has been on my must read shelf for years now, as has my antonia. i'm interested in the book i saw on your shelf titled "siblings without rivalry…" who recommended it? have you read it yet? please let me know, i may have to add that one. cath, are you on goodreads? you must get on goodreads. you can also post your reviews there and rate books – it is like facebook for true book lovers. if you get on there please friend me! Loved finding your blog. You are amazing. Andrea!! Loved finding YOUR blog! Thanks for stopping in. Sure do miss you guys! Corinne – Siblings without Rivalry was recommended by my friend Martha, who is an exceptional Mother. She also has twins and said it's great for parents with multiples. I've started Angle of Repose three times. Something always ends up trumping it. I need to just dive in. As for Willa Cather – beautiful. Good Reads. hmmmm… I've been debating for a year now. I'm worried it will just be one more thing for me to keep up. But I HAVE thought about it! Maybe in another year, when I can actually follow the news, shower daily, eat lunch. You know – things like that! Do we have a dinner date yet? ?